Agni Tea is a simple beverage that helps to regulate and stimulate your digestive capacity, improving all the functions of digestive agni. And, it’s delicious! Bring all of the above ingredients to a boil. Boil for 20 minutes. Take the pot off the burner and cool for a few minutes. Add the juice of 1/2 lime. Do not boil the lime juice. Pour into a thermos and enjoy throughout the day. Balancing for Vata and Kapha. Pitta can enjoy in moderation. Courtesy of Dr. Vasant Lad and the Ayurvedic Institute. 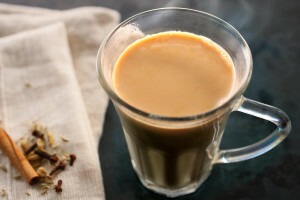 Once upon a time, during a Panchakarma retreat, I was making a big pot of chai for the practitioners to stay energized. I was inspired to add some ashwagandha and cacao powder. It was so yummy and nourishing! Just recently, I took this recipe to a whole new level by adding: ghee, salt and honey. Wow! Reduce heat, cover and simmer for 15-30 minutes. Return to boil briefly, then, turn off heat. Add 1 bag black tea or rooibos tea. Steep tea bag in mixture for 5 minutes. Balancing for all doshas when enjoyed in moderation. Energizing, digestive, mood enhancing, aphrodisiac, nourishing. Soak 10 strands of saffron in ½ tsp rose water. Let stand for 15 minutes. Toss everything together, place dates on ovenproof baking dish. 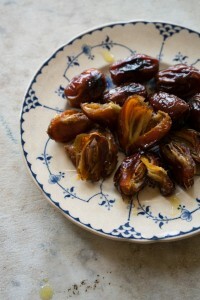 Broil until the insides of the dates become unctuous and sticky, about 4 minutes, being careful not to burn. Yummiest when served warm but can be enjoyed anytime! Nourishing for Vata and Pitta. Kapha can enjoy in moderation. Benefits: Builds Ojas (your vital immune essence), aphrodisiac, nourishing and delightful. It’s like ‘Ayurvedic Candy’’. Honestly, I cook very intuitively and rarely follow recipes myself. I recently prepared this soup for a gathering and a friend requested the recipe. Here is my best attempt at sharing it! It’s a great soup to share with others. 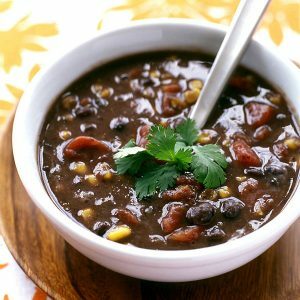 1 cup dry black beans overnight. Drain and cook well in about 8 cups water with 1 tsp. salt, set aside. Optional: chopped butternut squash, zucchini, greens. Cook everything together until veggies are tender and it tastes delicious! Serve with fresh cornbread, rice or quinoa. 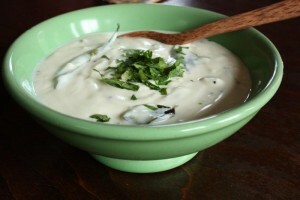 You may garnish with cilantro, sour cream and/or lime. This is a great Fall/Winter soup for Kapha. Bata and Pitta can enjoy in moderation. Combine everything in a small bowl. Enjoy as a side dish to kitchari or other PK meal. This salad-chutney is cleansing to the gall-bladder and liver, helps secrete digestive enzymes and is yummy! * If you like a more liquid consistency, you may add a bit more water. Stir everything well and enjoy!!! Can be refrigerated for a few days. Tastiest and best digested at cool-to-room temp, rather than cold. Vata and Pitta can enjoy regularly. Kapha can enjoy in moderation. 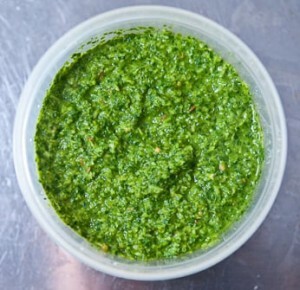 Wash cilantro, remove stems and place in the blender with the mint, coconut, avocado, ginger, turmeric and water. Blend until just grinded. Dry roast the cumin, mustard and fennel seeds. This releases the fragrant essential oils from within the seeds. Add seeds to blender, along with lime juice, honey and salt. Blend until smooth. Enjoy as a condiment alongside kitchari, a rice bowl or a plethora of other dishes. This yummy summertime condiment contains all 6 tastes and is balancing for Vata, Pitta and Kapha. Enjoy! Directions: Place all ingredients on a pot and bring to a boil. Reduce heat and then simmer for about 30 minutes, stirring occasionally. Serve a small portion as a side dish or condiment. Enjoy! * 1 medium cucumber: peel, halve, scrape seeds out and grate. Lightly garnish with a few mint and cilantro sprigs. Serve as side dish to kitchari or your favorite curry dish. Yummy! This delicious raita cools Pitta while simultaneously supporting healthy digestion. Vata can enjoy regularly while Kapha can enjoy in moderation. 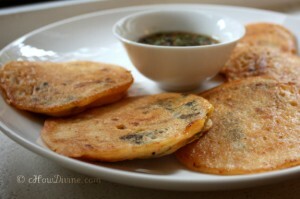 Enjoy with rice or chapatis! ½ cup each: 3 types of lentils – red, brown and split or whole mung beans. Pressure cook until lentils are soft. Whisk together. Cook together until veggies are softened. You can get amazingly yummy spices and blends here. You might make a smaller batch by cutting the recipe in half. These nourishing and delicious treats make great snacks when you’re relaxed or on-the-go. Nourishing for Vata, Pitta and Kapha. Wash the rice and mung dal well and let soak for a few hours, when possible. (Soaking lentils increases their digestibility and prevents gas from accumulating). In a saucepan over medium heat, heat the ghee or oil and add the mustard seeds, cumin seeds, hing and curry leaves. Stir until the seeds start to pop. Turn off heat and allow this mixture to cool momentarily. Add the rice, mung dal, turmeric and salt and stir until well blended with the spices. Add the water, turn the heat back on and bring to a boil. Turn the heat down to low, cover and cook until kitchari is tender, about 20-25 minutes. Garnish with: ghee, coconut, lime, cilantro, sunflowers seeds, Bragg’s Liquid Aminos, etc. 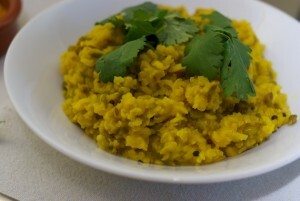 Kitchari is a nourishing, easily digestible recipe that is basic to the Ayurvedic way of life. 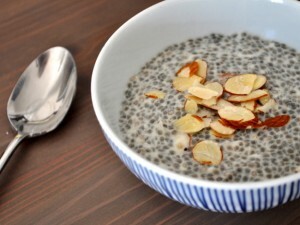 Together, basmati rice and mung dal create a very balanced food that is an excellent tridoshic protein combination. This tasty, complete food gives strength and vitality while nourishing all the tissues of the body. Kitchari is the preferred food to use while fasting on a mono-diet or while going through cleansing programs such as Pancha Karma. Kitchari is known for its detoxifying and anti-aging qualities on the cells of the body. This kitchari can be eaten by all doshas but is especially good for Vata. Pitta, add 2 tablespoons of freshly grated ginger, 2 tablespoons unsweetened, shredded coconut and a handful of cilantro leaves mixed in the blender and added after spices have finished sautéing. Kapha, 4 bay leaves, ¼ teaspoon cinnamon, ¼ teaspoon clove powder, ¼ teaspoon cardamom powder, 2 tablespoons freshly grated ginger, or ¼ tablespoon black pepper powder can be added at the time of sautéing the spices. Specific vegetables for your body type can be added as well, when the rice and dal are about half way cooked. Popular choices include carrots, broccoli, sweet potatoes, green beans and cauliflower. Balancing and nourishing for Pitta and Kapha. Where an apple is the king of fruits in colder climates, mango rules as the supreme queen in hot, tropical areas. 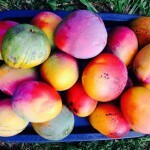 I recently returned from beautiful Kaua’i, where mangoes were very much in season. My daughter and I joined some dear friends in picking a wheelbarrow-full of gorgeous, huge mangoes of all colors. According to Ayurveda, ripe mangoes are tridoshic, energizing, aphrodesiac and soothing to the skin and tissues. Mangoes are a rich source of vitamins A and C and are known to effectively prevent cancer. My favorite way to enjoy a perfectly ripe mango is simply ~ sliced fresh. 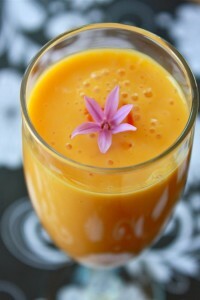 My second is in Mango Lassi, a traditional Indian delight. Peel and slice mangoes. 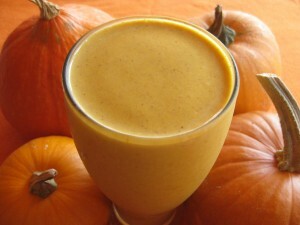 Put all ingredients in the blender and blend at high speed. Enjoy as a snack, on an empty stomach, earlier in the day, before dark. Pitta and Kapha can enjoy in moderation. This is a drink I often suggest to clients as a morning cleanser and refresher. Many people find that they don’t require coffee after this to get their bowels moving! If using a juicer, go ahead and juice everything into a glass jar and put aside, to be stored in fridge. If using a blender, go ahead and blend everything well and strain into glass jar to be stored in fridge. This is enough for a 3-day supply. I recommend making it fresh approximately every 3 days. Upon rising, after completing bathroom rituals, heat 1 cup water. Stir in 1 Tbsp raw honey, 1 pinch sea salt and ½ cup of above juice mixture. Drink and enjoy! Vata can enjoy regularly. 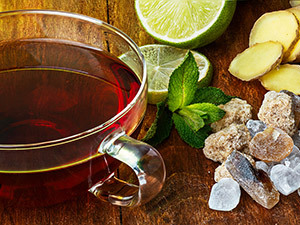 Follow up an hour or so later with your favorite morning tea and breakfast. This combination is slightly heating so it may not be appropriate for Pitta individuals every morning. Excellent for Kapha balancing and ama (toxin) reducing. Grind above mixture into a pancake-like consistency. Make 3-6 inch wide pancakes. Cook in either ghee or coconut oil. Enjoy with soup or chutney. Excellent protein source and easy to digest! 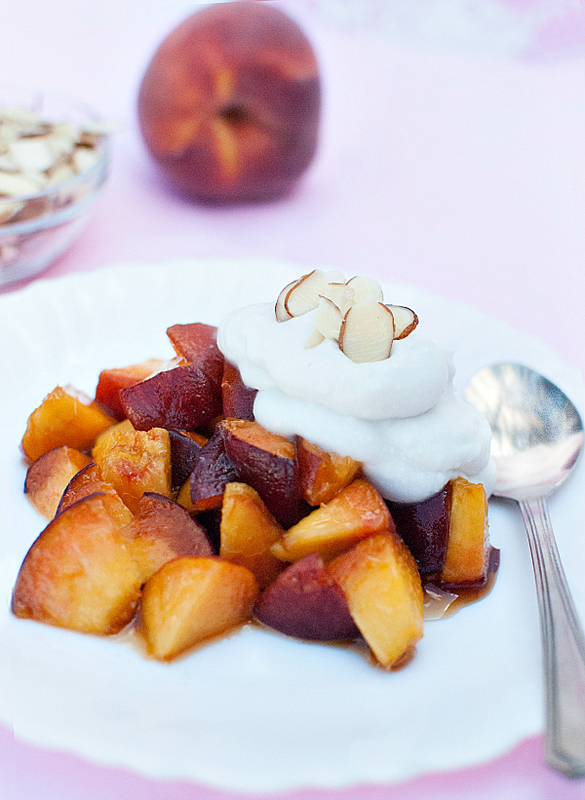 Place sliced peaches in 2 bowls, add dollops of whipped coconut cream on top finishing with a garnish of sliced almonds. 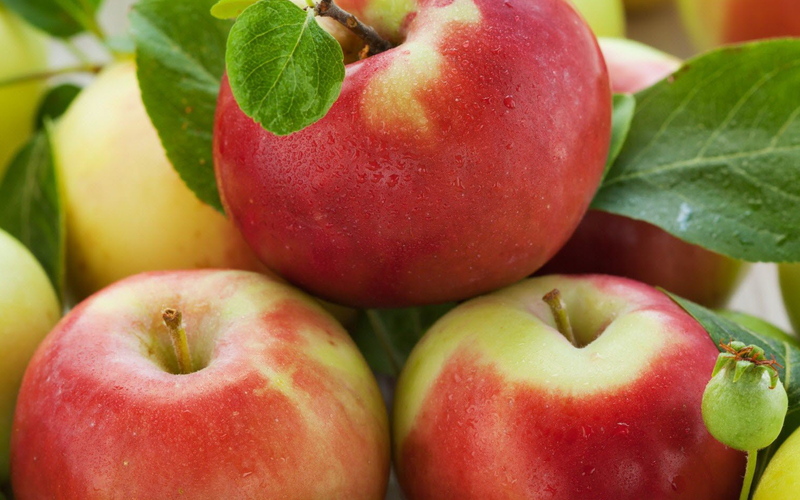 Ayurveda suggests eating fruit alone. So, allow some time to digest your meal before enjoying this treat. Optional: 1 Tbsp Chyavanprash, 1 tsp Ashwagandha powder or Shatavari Powder. Balancing and nourishing for Vata and Pitta. 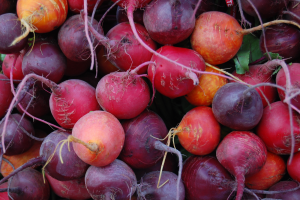 In Ayurveda, foods that deeply rejuvenate, are known to also possess aphrodisiac qualities. 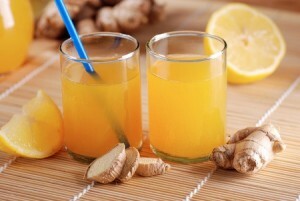 Boost your immunity, energy levels and libido with this delicious drink! This recipe can nourish and satisfy both men and women. I recommend this to many clients. For variations, you may add: ½ tsp. vanilla extract, a pinch fennel powder, a pinch turmeric powder, ½ tsp. rose water, 1 tsp. ashwagandha, shatavari or maca powders. Directions: Soak almonds for at least 6 hours, blanch in hot water and peel. 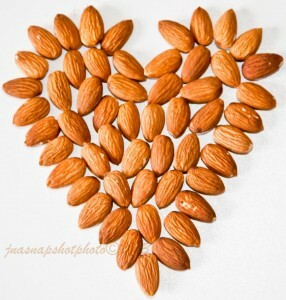 Discard peels, place all of the almonds in the blender with ½ cup of the milk or water and grind to a fine paste. Add remaining ingredients and blend for 2 minutes. Serve and enjoy warm or cool! Balancing for Vata and Pitta. Bake at 425 for 45 minutes. Enjoy with rice or chapatis. Yummm! Vata can enjoy in moderation, with plenty of ghee and spices. 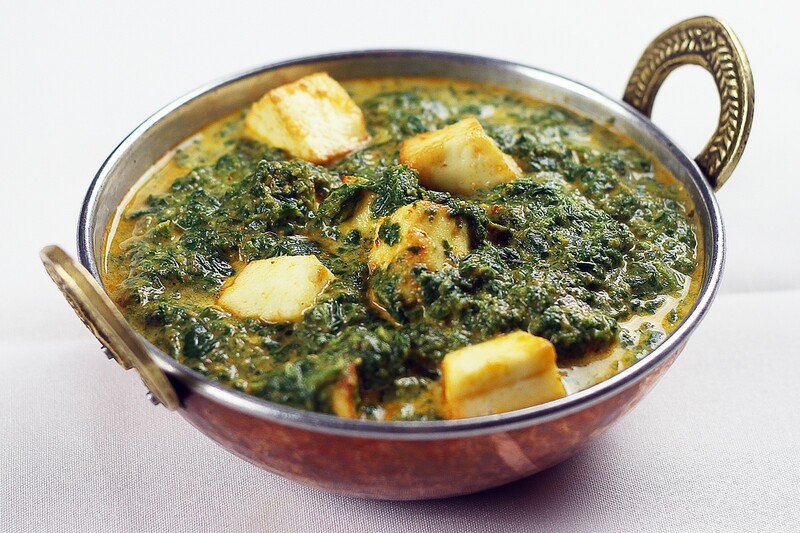 Saag Paneer is a favorite Indian dish for many. I always love to find places to add in fresh nettles, which are really abundant in the northwest in the early- to mid-Spring. I’m attaching a link here for a wonderful recipe. This is a recipe I absolutely fell in love with when I was living in Switzerland as a foreign exchange student. My host mother, Ursula, taught me how to make this. 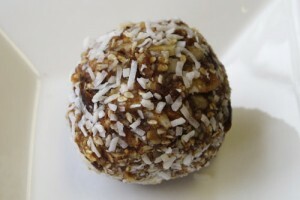 It is simple, delicious and gluten-free! Pour into lightly buttered cake pans or cupcake pans and bake for approximately 15-25 minutes. Cook until just firm; do not over bake. Remove from pan and cool. 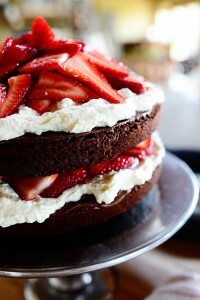 I like to apply lavish amounts of whip cream rather than traditional frosting. Try blending in powdered sugar, melted raspberries, pureed strawberries, blended dark cherries with almond extract, vanilla or rosewater. It’s lovely to decorate the cake with fresh flowers. Enjoy and share with someone you love!!! *** Okay, it’s not exactly an Ayurvedic recipe but simply pleasing to mind and body! Best way to eat this: on an empty stomach, with a cup of spice tea, in a relaxed mood. When seeds begin to pop, add 1 bunch asparagus, chopped in 3 inch pieces. Saute for 3-5 minutes. When asparagus becomes tender, remove from heat and add a generous squeeze of lime juice and ¼ tsp salt. Garnish with fresh cilantro. 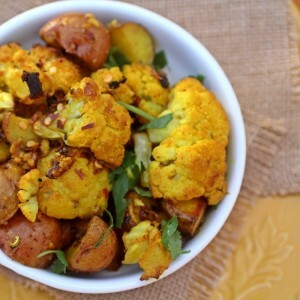 Serve as a yummy side dish to your lunch or dinner. 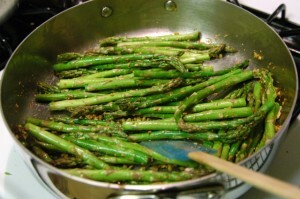 Asparagus is a seasonal springtime food, very supportive for the digestive system. This recipe is balancing for Vata, Pitta and Kapha.